For many Seattle yogis, husband and wife team, Rob and Melissa Lundsgaard need no introduction. They are well known for offering an accessible environment for both kirtan and Bhakti yoga and are regulars at many yoga studios in the area. We caught up with them to discuss their upcoming album and their participating in the Northwest Yoga Conference. Can you describe your music style/offerings in 1-2 sentences? We sing kirtan, a call and response form of group singing, in which we chant the names of the divine. 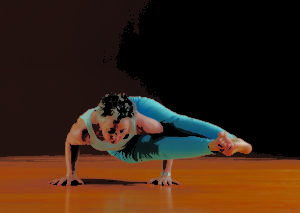 We lead groups in this way, or weave the mantra into asana classes. Some of our readers may not be familiar with kirtan. What is kirtan? Kirtan is a form of bhakti yoga. Bhakti yoga is the yoga of devotion or the way of love, and singing kirtan is a mode of expressing that devotion. We simply come together in a group setting and sing. The music and chanting of the mantra becomes a meditation. There is no set form or way of being, it can be meditative or ecstatic. You can sit or you can dance. It is a celebration and a recognition of the divine in each of us. 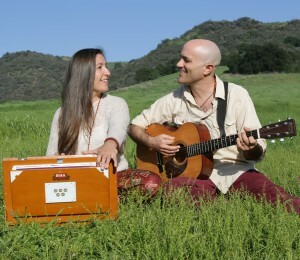 Can you give us a little overview of how you both found kirtan and found each other? We found each other a long time before we discovered kirtan. We met at a wedding on Kitsap Peninsula, and at the time we were both leading very different lives. Our relationship and our devotion to each other developed quickly, leading us toward a similar way of being in our daily and professional lives. Kirtan found us slowly over time. Our first experience was with Krishna Das, and although we loved it, we never imagined that we’d do it ourselves. But, the seed was planted. Rob wrote a song called ‘Breathe,’ which caught the attention of a yoga teacher, who then asked him to come lead kirtan at her studio. Pretty soon we found ourselves immersed in mantra, chanting, devotion and our undeniable love of kirtan. You are working on a new album and currently have a fundraising platform going to help raise the necessary funds. 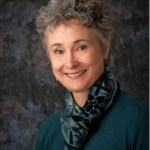 What is an unexpected lesson that you have learned from the process of opening up and asking the community to support you? Although not an easy feat to run a fundraising campaign, we have been blown away by the support. Not just from the backers who have contributed to the campaign with their dollars, but also the countless people who have shared it with their friends on social media, and even the folks who convinced us to reach out to our community in the first place. Sharing our love of and through the music, mantras and bhakti yoga helps make this project a beautiful exchange. It is an uplifting and inviting way of being and gives us a chance to spread joy, making it accessible to anyone who wants it. On your new album, you are working with producer Ben Leinbach who has worked with the likes of Deva Premal, Snatam Kaur, Jai Uttal, just to name a few. What has this process of collaboration been like for you? Working with Ben has been incredible. He is a magician of sound – quick, fluid and creative, but also a brilliant musician. It’s been an easy, collaborative and fun experience. We look forward to many more collaborations in the future. What can listeners expect from your new album? Our first record, ‘Bolo’ was pretty bare bones, just our voices and Rob’s guitar, yet we were really happy with the way it turned out. For this new CD, ‘Tejase,’ we didn’t want to lose the essence of ‘Bolo,’ or the sound that listeners may have come to expect from us, but wanted to add a little more depth to our offerings. ‘Tejase’ definitely has more bells and whistles (literally! ), but it is still very much Rob and Melissa, easy to sing along with and great for a yoga class playlist. 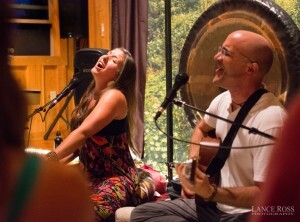 You will be providing live music during two yoga workshops at the Northwest Yoga Conference. How does this enhance the experience for attendees? Live music in a yoga class adds an entirely new dimension to the practice. 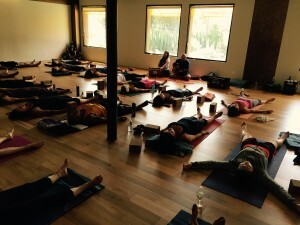 These ancient Sanskrit mantras have a life and energy of their own, and our bodies and minds are especially open to healing and transformation when we are on our mats, practicing asana. This opening increases as the class goes on, and the live music pours right through that doorway, even if the practitioner isn’t consciously aware of it. Rob and Melissa’s new album, “Tejase” will release in the Spring accompanied by a West Coast tour. Tour dates and locations to be announced by the end of the year. Please consider supporting their Kickstarter project which ends in only 4 days! 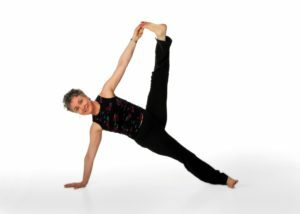 As an extra incentive, we will be giving away a spot in each of the workshops that they are playing music for at the conference, “Yogic Lore Flow” and “Holy Trio”. To be eligible, simply support the Kickstarter!